North River Sing Carolers fill Grace Church Van Vorst with festive song at the Sixth Annual Grace Holiday Concert, in Downtown Harsimus Cove, Jersey City. The Jersey City community was treated to an afternoon of musical holiday cheer at the Sixth Annual Grace Holiday Concert on Sunday, December 13th at historic Grace Church Van Vorst in the Downtown Harsimus Cove neighborhood. 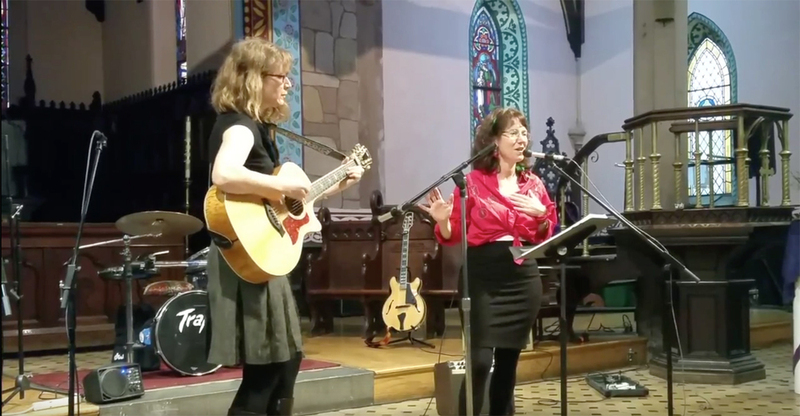 About 100 attendees heard Jersey City’s favorite professional and some-time musicians and vocalists perform a fun assortment of holiday favorites for a suggestion donation of $5 benefiting the progressive Episcopal church. Kicking off at 2:00 p.m. and lasting until 7:00 p.m. performers and concert-goers enjoyed a festive atmosphere, chatting with friends and meeting neighbors, tasting home-baked treats, and wandering in and out of the venue freely during the five-hour event. Home-baked treats at Grace Church Van Vorst. Long-time Jersey City residents Amy Elise and Anthony Blunda organized the event for the sixth time with the simple goal of bringing people together for a festive celebration. Now a beloved tradition, Blunda notes about half of the performers participated in last year’s concert. Singer Lissa Sarno Welles, accompanied by Chrissy Roberts on guitar. Nicholas Ciavatta played acoustic guitar and sang "Winter" by the Rolling Stones. "Jersey City has an incredibly vibrant arts and music community, and the Grace Church Holiday Concert is one of those events where just about everybody, of all faiths and backgrounds, comes out to play and support. It's a truly fabulous event!" Spouses Erin Callahan Kumpf and Ben Kumpf harmonized on vocals and acoustic guitar as folk duo Twiddlin' Thumbs. Lending an easy country style to the program, their selections included an original called "Waiting for the Snow," a traditional song "Angel Band," and two covers, "Red Clay Halo" by Gillian Welch, and "Carriage" by The Felice Brothers. Folk duo Erin Callahan Kumpf and Ben Kumpf, known as Twiddlin' Thumbs. Liam Butterscotch regretted missing the concert this year due to the flu, saying, “It's one of my favorite annual events, I was bummed to not be part of it this year. There is a great camaraderie between the local musicians. I always do “A Fairytale of New York” by the Pogues, which is probably not a song that should be sung in a church, but it's too good to not sing it." The lineup included notable Jersey City vocal ensembles. Acapella quartet Cabaret Sauvignon sang “Angels We Have Heard on High,” and the North River Sing Carolers, an off-shoot of North River Sing community chorus, filled the church with festive song. The lively church seemed to count as one of the music-loving souls. Situated among the Harsimus Cove neighborhood’s charming residential brownstones, Grace Church sits at the corner of Erie and Second Streets, steps away from the trendy bars, restaurants and shops of the Grove Street Pedestrian Plaza. On the State and National Register of Historic Places, Grace Church was designed by Danish architect Detlef Lienau (1818-1887), founder of the American Institute of Architects. Construction of the English Gothic-style Revival church was completed in 1853, and was named after the then-called Van Vorst township (named after Cornelius Van Vorst, the twelfth Mayor of Jersey City from 1860 to 1862). The stately church is constructed with coursed Belleville brown sandstone ashlar, adorned with architectural accents such as an iconic red doors, bluestone trim, and buttresses lined with lovingly maintained colorful details. The church’s interior can be seen decorated with colorful boughs of crepe as if each gathering were a party. With a Rector lead by Reverend Laurie Jean Wurm the forward-thinking church functions as a community center and event space, mobilizing hundreds of volunteers to offer dynamic programs serving those experiencing nutritional, housing, health, and social insecurity. Grace Church attracts an energetic congregation with an active music ministry, “toddler drop-off,” and the largest used book shop in Jersey City. Engaging Jersey City’s thriving arts community, Grace also hosts a major annual event as a fundraiser, the Cathedral Arts Festival, spanning music, dance and visual offerings. In it’s 26th year, the festival’s expanded to include an inaugural season of eclectic programming year around with Cathedral Arts Live, with $10 in advanced admissions, $15 at the door. Tom rode his bike down from the Heights neighborhood to attend with the hope of getting into the holiday spirit, and mingle with members of the Downtown community. Why not mark your calendar now to check Grace Church’s website on December first?